I think you get the idea. These were the first three definitions that were immediately found while typing into a search engine. I may be going out on a limb here, but I would say that these definitions confirm what the majority of people believe about “ghosts.” After all, it’s in the dictionary…right?! The year was 1996. It was about one o’clock in the morning when a friend of mine decided to go back to his dorm room after hanging out for a few hours. I was tired and decided to make one last stop to the bathroom before heading to bed. The bathroom was located right next to my dorm room. The building was completely quiet and most of my fellow inhabitants had gone to sleep. I was thinking of my evening and I had no idea what was about to happen. I left the bathroom stall and stood in front of the sink to wash my hands. The bathroom had white walls and it was properly lit. There was a large mirror above the sink. It happened very quickly. I was looking down while scrubbing my hands when suddenly something caught the corner of my eye. 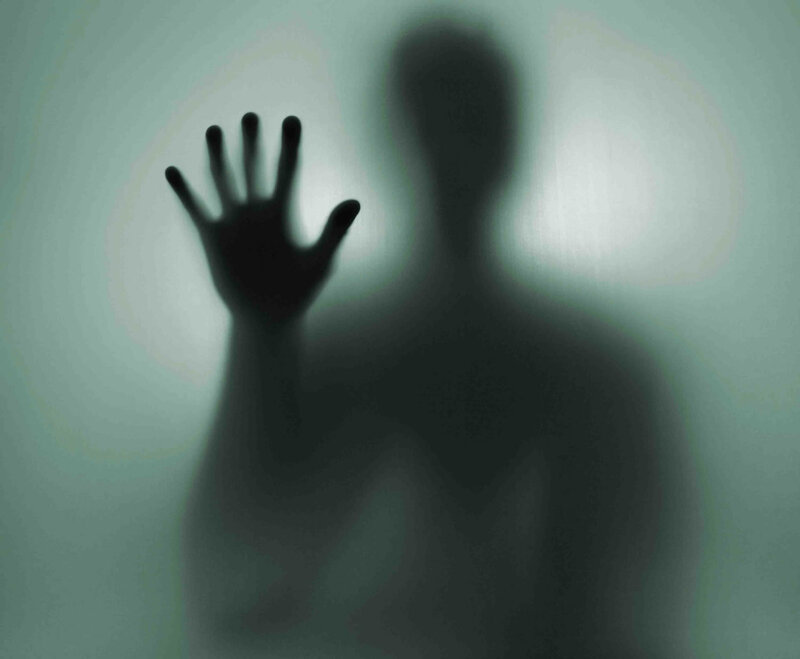 To my sheer horror I watched as a large black shadow with a basic humanoid shape moved across the back wall behind me. It was your own shadow! No, it wasn’t. I had momentarily stopped moving due to the shock of seeing this shadow moving all around the wall. I was completely still. There was nobody else around. I saw this black shadow moving and it didn’t take me very long to yell out a quick swear word and bolt out of that bathroom. A few days later I was speaking to a couple of girls across the hallway that also lived in the residence. One of the girls was a believer in the religion of atheism. I happened to mention what had happened and I was told to talk no more about it. They both admitted that they had seen the same shadow. During this time I was fascinated by the paranormal. For years later I continued to be interested in anything paranormal including ghosts or aliens. Basically, any unexplained mystery got the best of my curiosity. I would be glued to the television if any paranormal show came on. My lifestyle was that of a typical college kid. Parties. Bars. Quite sinful indeed. That was the year I tried my first joint as a matter of fact. Certainly nothing to be proud of looking back. I had researched “ghosts” enough that I considered myself quite knowledgeable on the subject. They were the spirits of people who died but continued to linger around on earth – often with unfinished business. Am I right? Is that what we’re taught? Go towards the light! How many times did I hear that over the years. Of course, I had numerous books on Near Death Experiences (NDEs). I had also studied NDEs for years. I’ll give you a very basic outline of what the majority of people describe in their NDEs. In a nutshell, they physically “die” for a short period of time. Then they go through a tunnel towards a light. They have a life review with a “being.” For most it’s a ‘heavenly’ experience. Then most are told that they need to go back because their work isn’t done yet. I had also studied the work of mediums and psychics and I had believed them to be real. The mediums would claim to see and/or hear the dead people who lingered on earth and pass along messages to their living relatives. Some of the messages that were passed on were so personal that no other living person could know it. This would seal the person’s belief that they were indeed actually communicating with their deceased loved one. Oh the vast amounts of money these heretics have made off the pain of people searching for answers. Are you starting to see how these topics are all connected? The actual ghost sightings are supposed spirits of dead people. “I see dead people!” No. No you don’t. The mediums communicate with these dead people and pass along messages of hope and closure to the living. As if that’s not enough, which clearly it’s not, the Near Death Experiences supposedly confirm the vast majority of people have absolutely nothing to fear about death and they’re pretty much all going to heaven. What is this called when basically everyone is saved? It’s called Universal Salvation. Is this true? Is it true that the vast majority of people are going to heaven? In the NDEs it doesn’t seem to matter what belief system the person had – they’re going to heaven! What does the Bible teach? What does the Bible say about the fate of most people when they die? This above scripture states very clearly that ‘wide’ and ‘broad’ is the way that leads to destruction. “Destruction” is Hell. The majority of people are going straight to Hell. Does this really sound to you that dead people linger around on earth once they die? Certainly not! It also blasts away the reincarnation lie that we have countless lives to “get it right.” No. We have just this one! Then, judgement. Are “ghosts” real? No. Not the way they would like you to believe. If they are not lingering spirits of dead people – then what are they? If you haven’t guessed it by now then here it is: THEY ARE DEMONS! I’ll summarize what is really going on: Satan is the “Father of all lies” (John 8:44). Lucifer sinned through pride and wanted to be God. There was a war in heaven. God threw Lucifer out and Lucifer became known as Satan (Isaiah 14:12). A third of the angels in heaven also rebelled against God and they were also thrown out (Revelation 12:4). The fallen angels are known as demons or devils. Satan hates God and wants to hurt God – but, he can’t directly hurt God. So what does Satan do? Satan goes after God’s most cherished love – us! Satan causes Adam to sin by lying in the garden (Genesis 3:5). The sin of Adam is passed down from generation to generation due to the consequences of Adam’s sin (Romans 5:14). We are literally born into sin. It’s not only in our actions but in our DNA (that is why Jesus was literally born of a virgin) (Matthew 1:25). We are made in God’s image (Genesis 1:27). Satan and his demons lost the war when Jesus went to the cross. Jesus achieved complete victory on the cross (1 Corinthians 15:54-57). For all those who believe in Jesus – Jesus’ (who is God the Son) own blood is payment for their sins (John 3:16). Salvation is through faith in Jesus alone (Ephesians 2:8-9). Satan’s judgement is the lake of fire for all eternity as well as for the angels (Revelation 20:10). All those who reject Jesus will eventually end up in the lake of fire as well – in eternal torment and agony forever and ever because they died in their own sin (Revelation 21:8). There is only one way to have our sins forgiven and that way is Jesus (John 14:6)! Satan will use whatever lie is necessary to hook that individual. That is why there are so many lies in this world. Layers upon layers of lies. The true living God is still in complete control – however, the Bible states that Satan is god of this world (2 Corinthians 4:4). This explains why there are countless lies. I’ll tell you honestly. If you go by what the world teaches – it will lead you straight to Hell. Satan’s strategy is to provide so many lies that eventually one lie will stick and you will be deceived. What is the purpose of the lies? The purpose of the lies is to lead the person away from the truth of Jesus Christ. Once that person is blinded from the truth of Jesus – then they wouldn’t turn to Jesus to be saved and have their sins forgiven. To simplify even more, Satan wants you to die in your sins! That’s his goal. One of these many lies to keep people away from a saving faith in Jesus is the satanic lie of “ghosts.” Only those who put all their trust in Jesus, the ‘narrow gate’, will have their sins forgiven. There is a very real spiritual war happening all around you. You may not see it – but it is there. Jesus achieved victory and salvation is a free gift – but you have to receive it. Jesus states in the Bible that He knocks – open the door and invite Jesus in (Revelation 3:20). What about “ghosts” looking and acting like deceased relatives? The truth is that there are demons watching our every move. Not to scare you but to wake you up – there are demons watching you at this very moment. They can see you all the time. Every minute of the day. There are demons specifically assigned. They are even called the “watchers.” The “ghost” acts just like your dead grandmother? That is because there were demons who watched your grandmother from the cradle to the grave. They have the supernatural ability to imitate your deceased grandmother to perfection. Every single subtle gesture. Remember also, these ancient unclean spirits have been watching human behaviour for centuries. The above scripture shows how a female was possessed by an unclean spirit that was giving her “inside” information so that her masters were prospering. Eventually the possessed female annoys Paul enough to cast it out. After the unclean spirit was cast out, the scripture goes on to state that the masters stopped prospering and became angry. Mediums are possessed and getting their information from demons. That is how the Medium knows secret information. Mediums are complete heretics and they are in no way helping people – the only way they are helping people is by helping to lead them to Hell. What about Near Death Experiences? That’s a good question. A question that I’ve thought about for years. However, it’s actually a very easy answer. THEY DID NOT DIE! They may have supposedly “died” for minutes – but they did not die. When people truly die – they don’t come back. They are, after all, called Near Death Experiences. Does Satan fool and blind people up until the very last moment? Absolutely. In fact, I think many of the NDE victims fall right into Satan’s scheme because they come back preaching Universal Salvation! What better testimony! The truth is that Jesus Christ is the ONLY way.